The idea of hard rock and afrobeat joining forces seems slightly silly. Slightly… well guess what, it is not an idea anymore, it’s real and it sounds pretty good as well. Antibalas’ Marcos Garcia takes up the experiment to mix up heavy acid rock with afrobeat. In this newly created outfit Garcia brings together fuzzed guitars riffs, organs and complex polyrhythms. The result Here Lies Man delivers is appealing and could even get your feet shuffling and your head bobbing. The opening track ‘When I Come To’ is the perfect example of what Here Lies Man has to offer in the 30 minutes the album spans. It’s fuzzed up riffs, beats and minimal lyrics are demandingly hypnotizing. The sonic wall is deepened by the excellent drum work of Geoff Mann who in fact lures you in further and further until to moment you realize you already progressed to the fourth track or so. For me the ripping guitar and upbeat ‘You Ain’t Going Nowhere’ brought me out a trance. For a brief moment, that is. ‘Letting Go’ gears up the pace a bit further and pounds in woozy synths which are combined with some great acid funk. It’s like the Meridian Brothers meeting Fela Kuti and Deep Purple. ‘So Far Away’ serves as the album’s resting point. Here the tempo is slowed down by the band but they also kick in a killing distorted guitar riff which cuts through an enchanting polygonic mist. 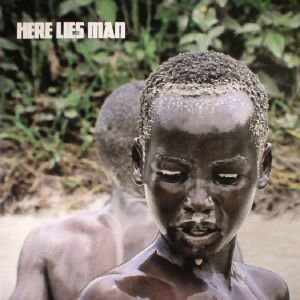 Here Lies Man picks up the hefty percussion on ‘Belt of the Sun’ and the closing title track. Both tracks are full of tribal beats, sloganeering vocals and dirty edged organs and guitars which will undoubtedly leave you out of breath after the last seconds of the album tick away. At times Here Lies Man can become a drag. The riffs are very much up front and only thrive on repetitiveness. The 8 tracks therefore sound similar to each other. Only ‘So Far Away’ sounds somewhat different. Nevertheless the stylistic choices bring a nice buzz of intensity. It’s catchy and refreshing take on the classic forms of afrobeat and hard rock that works well, …especially on those hot summer festival nights. This entry was posted in WRM and tagged 2017, acid funk, Afrobeat, Antibalas, cd, Deep Purple, Feli Kuti, Geoff Mann, hard rock, Marcos Garcia, Meridian Brothers, polyrhythms, review, RidingEasy, Rock. Bookmark the permalink.